Fused Filament Fabrication (FFF), or Fused Deposition Modelling (FDM) as it’s more commonly known, remains one of the most popular 3D printing technologies. And as the technology continues to evolve, FDM is finding more industrial applications on the manufacturing floor. The development of new polymer materials is a key factor behind this development. In today’s tutorial, we’ll be looking at three popular thermoplastic materials available for FDM 3D printing: ASA, PETG and PC. We’ll explore their benefits, limitations, as well as tips for successful printing. Acrylonitrile Styrene Acrylate (ASA) is a common 3D printing thermoplastic that has a high UV and chemical resistance. Originally developed as an advanced version of ABS, ASA is more suitable for outdoor use than ABS, which can be damaged by prolonged exposure to sunlight. Although ASA is structurally very similar to ABS, there are a few key differences. For example, ABS can become brittle under sunlight, whereas the material formulation of ASA makes it ten times more weather resistant and UV-resistant than ABS. Its superior resistance to UV rays and weather exposure therefore makes ASA a good option for outdoor applications. Strong mechanical properties: ASA has a high impact and temperature resistance, which means parts can withstand mechanical stress for a long period of time. UV-resistant: The material has exceptional UV stability, meaning that it retains its properties when exposed to sunlight. Great chemical resistance: ASA can withstand a wide range of chemicals, including saturated hydrocarbons, lubricating oils, vegetable and animal oils, aqueous salt solutions, weak acid and alkalis, and water. Easy post-processing: ASA lends itself well to various post-processing techniques. Sanding, painting (with acrylic paints), glueing, milling, drilling, and cutting – all of these post-processing steps can be done with an ASA part. The material also dissolves in solvents like acetone, which makes layer lines easy to smooth. What are the limitations of ASA? High extruder temperature required: When printing with ASA, both the extruder and print bed temperature must be high, making the printing process very energy-intensive. Tricky to print: When the printing temperature is not properly set, it creates internal stress as parts are printed, which can lead to warping, weak parts, and layer separation. Fumes: ASA emits intense and smelly fumes during the printing process. The fumes may cause irritation and headaches, so it’s important to ensure that your working space has good ventilation. However, many available FDM 3D printers are equipped with either an enclosure or a filter and a fan for fume extraction. Thanks to its UV stability, ASA is well-suited for outdoor applications, ranging from electrical housings to garden equipment and automotive parts. Good mechanical properties and a relatively low price point make ASA a great choice for functional prototypes and some end-use parts. 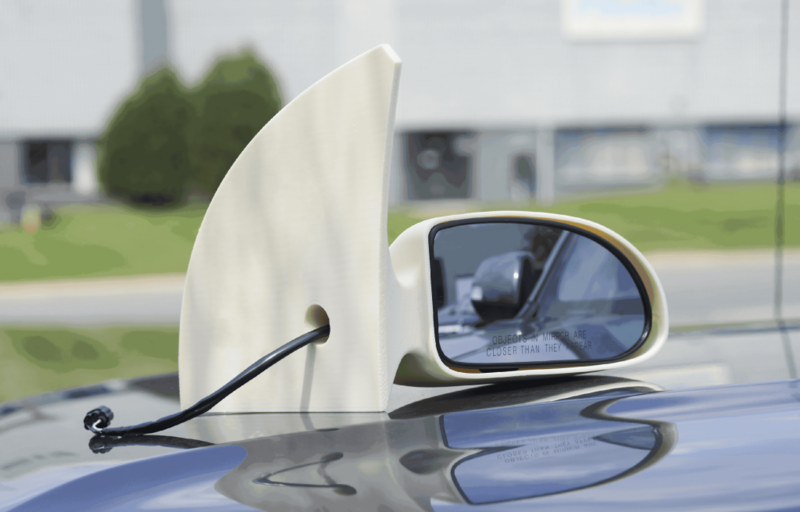 For automotive applications, ASA can be used to prototype parts, including bumper covers, grilles, side view mirror housings and dashboard holders. Lightweight ergonomic handles/grips, assembly fixtures and jigs, dunnage, tool caddies are also applications that are well-suited for ASA. ASA is very temperature sensitive. With different ASA filament manufacturers having a slightly different ideal temperature setting, it’s always recommended to follow the requirements specified by your filament manufacturer. To prevent warping and layer separation, using good adhesion such as Kapton tape is advisable. Kapton tape also helps evenly spread the heat on the print bed and achieve prints with a glossy bottom. Because of high printing temperatures, parts printed with ASA can be subject to overheating, resulting in poor quality output. To avoid this issue, a good rule of thumb is to print the first few layers at a higher temperature and then lowering the temperature by 5 degrees for the rest of the print. Using a cooling fan is another way to deal with overheating. It’s advised to use the layer fan at the minimum possible speed (10-25% of the total power). This will help to cool down the material without producing a sudden temperature change that can cause cracking. On the post-processing side, ASA parts can be smoothed by immersing the printed part in an acetone bath. It can then be glued and painted directly without the need for applying primers. Used for everything from food packaging to water bottles, Polyethylene Terephthalate Glycol (PETG) is one of the most widely used polymers today. PETG is a variant of the more commonly known PET material and is used as a filament for 3D printing. However, PETG ist glycol-modified, which makes the filament clearer and softer than PET and far more suitable for 3D printing. This thermoplastic combines the most useful properties of ABS and PLA. With the strength of ABS and the ease of use of PLA, PETG stands out as a durable, temperature-resistant and relatively flexible material, ideal for mechanical parts and functional prototypes. It’s superior to ABS: PETG is impact resistant and more durable than ABS. Thanks to a strong layer adhesion, it can better withstand UV light and is generally less challenging to print with. Additionally, PETG emits no smelly fumes. Few temperature-related problems: When printing with PETG, it’s less likely that your part will warp or shrink because of temperature changes. It’s considered food safe: That said, be sure to check the specifications of the filament manufacturer in question. PETG is hygroscopic: This means it absorbs moisture from the air. Air humidity negatively affects the material and can lead to failed prints. For this reason, the filament should be stored in a dry environment. PETG is prone to “stringing”: This occurs when the extruder melts more material than it ideally should. As the extruder moves, the extra material drips, sticking to the layer and causing strings, which affect the accuracy of a print. Properly tuning the printing settings can mitigate this effect. Possible fusing to the print bed: At times, PETG can fuse to the print bed during the printing process. This can make it difficult to remove without damaging the surface of the print bed. Therefore, it’s strongly advised not to print on surfaces like glass and PEI. Instead, you can coat the build surface with a release agent like gluestick or hairspray to guarantee a successful print. Due to the PETG’s properties, which make it difficult for adhesives to stick to, parts can be tricky to paint or glue. 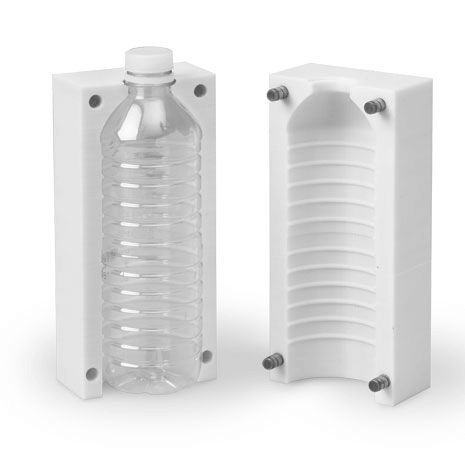 As it is considered food safe, PETG is a common material in the manufacturing industry, where it can be used for water and drinks bottles, cooking oil containers, and FDA-compliant food storage containers. Since it is highly impact-resistant, PETG is also suitable for printing products that may experience sudden or sustained stress, such as protective components, prosthetic devices, jigs and fixtures and mechanical parts. Product packaging is another instance where PETG can be used. For example, transparent packaging made from PETG can be used to showcase an item, while the material’s impact resistance will keep it safe. 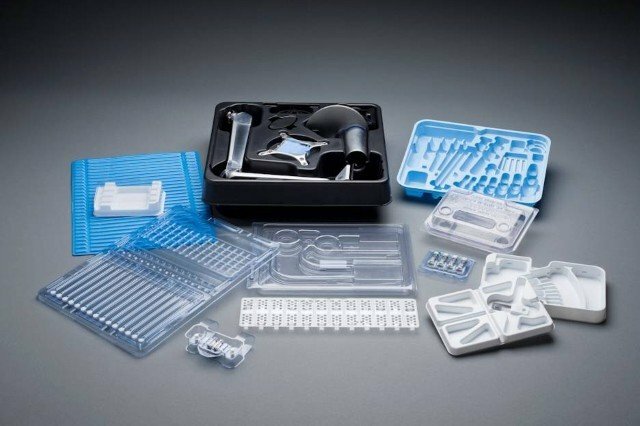 PETG’s ability to withstand rigorous sterilisation processes also makes it suitable for pharmaceutical and medical device packaging. Always start with a low print speed of around 15mm/s, which will usually help you find which settings work best with your material. Once you find out what the best settings are, you can increase your print speed. To prevent oozing and stringing, you can increase the retract length by a bit – add a 1mm for a direct extruder and 2-3mm for a Bowden type of extruder. If you still get strings, you can use a heat gun to burning any remaining strings off one a part is finished. If the layers in your print begin to separate or crack, you’ll need to reduce the cooling fan speed. The less cooling used, the more time the extruded layers will have to fully bond with the rest of the part. Polycarbonate (PC) is one of the strongest engineering plastics available for 3D printing. If you require tough, heat resistant and dimensionally stable parts that can withstand strong impacts, then PC will be an attractive material option. PC can be quite challenging to 3D print, since it requires high temperatures to extrude correctly and has a greater tendancy to warp and split than other thermoplastics like ABS. However, once mastered, it can produce strong and durable 3D printed parts for your next engineering application. Why 3D print with PC? Excellent material properties: PC is a rigid material offering high stiffness, strength and heat resistance. PC exhibits moderate chemical resistance and excellent temperature resistance. Good optical properties: PC’s transparency is comparable to glass. The material transmits visible light better than most other plastics, including PETG. Easy post-processing: the high impact resistance of PC makes tumbling a suitable option for automated post-processing. By vibrating grit particles, the layer lines can be smoothed quickly without damaging the part. What are the limitations of PC? Just like PETG, PC is hygroscopic, so you should keep the filament in a controlled, low-humidity environment to prevent it absorbs the moisture from the air. PC is not the easiest material to 3D print if the optimal conditions aren’t met. Because of its high heat resistance, PC needs to be printed at a high temperature (typically above 250 °C). However, high temperatures can lead to a build-up of internal stress in a part, causing it to warp, delaminate and poorly stick to the print bed. PC has been used in applications as wide-ranging as sunglass lenses, scuba masks, electronic display screens and phone cases. Since it’s strong and heat-resistant, PC is ideal for high stress, load-bearing applications and can be subjected to temperatures as high as 110 ºC. Injection moulds for low volume manufacturing, tools and functional prototypes are all good candidates for 3D printing with PC. Carbon-reinforced PC is also well-suited for making intake manifolds and other parts that are subject to high temperatures. PC requires a controlled, high-temperature printing environment. To ensure a controlled environment, it’s recommended to use a fully enclosed 3D printer. This will keep the temperature inside the 3D printer at the necessary level, facilitating a higher print success rate, better quality, and performance of the printed parts. To achieve the best print bed adhesion, a good rule of thumb is to apply a thin layer of glue to a build plate or to use PEI sheets. When 3D printing with PC it is important to print with the cooling fan off to prevent curling and warping. PC filament is prone to oozing when printed. To prevent this, try increasing the retraction distance and retraction speed. However, to prevent your nozzle from jamming, avoid retraction distances of over 10 mm. Choosing the right material for your needs depends on your specific application. ASA, PETG and PC all have their advantages and applications to which they’re best suited. If you’re looking for a filament to make parts for outdoor purposes and prototypes ASA is a great choice. For strong and durable functional prototypes, you may want to take a look at PETG. Finally, choose PC filament if you want to 3D print transparent but very stiff parts. 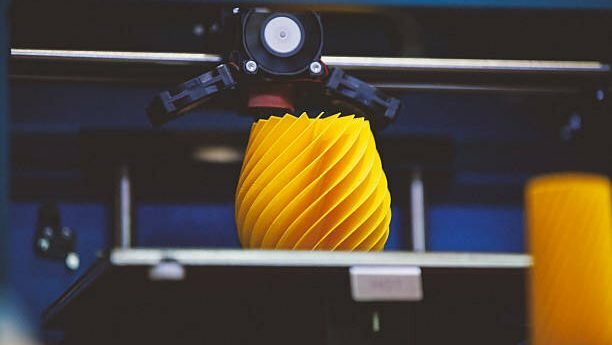 FDM 3D printing can sometimes be tricky; however, with the right approach these challenges are surmountable. Should You Buy a Multi-material Printer for Your Additive Manufacturing Bureau? AMFG's Keyvan Karimi: "Why it's Time for Additive Manufacturing Software to Evolve"